Steve Let it shine, let it shine. On Christmas Eve afternoon I was standing in line at a grocery store behind an elderly gentleman when a grandmotherly-age, smiling lady in a head scarf and flowing dress with three microwavable popcorn boxes in her hand said "Excuse me..."
I realized she was with the gentleman ahead of me, stepped aside for her and asked her if she were going to watch a movie and eat popcorn. Pointing to the popcorn, she answered, "My grandchildren..." She said "Merry Christmas" to me. I thanked her and asked her what she celebrates. "Ramadan" she replied. It was a pleasant encounter across different cultures. I would have enjoyed more exploration of her story. One of my favorite words is "explore." For me it evokes friendliness, openness, curiosity, adventure and new information. Best of all it's non-threatening. For example, by exploring (and visiting) I found schools that were a good match for each of my children. Now, when many schools offer open houses, is a great time to explore all your educational options. Open houses are an opportunity to compare written missions with reality, to ask questions, to observe interactions, meet teachers, students and other parents. After an open house visit, if your child has particular needs or challenges, schedule a personal visit. Steve talks about whether, as parents, we are instilling in our children, love and hope rather than fear and anger. The latter can be devastating, the former uplifting. May I gently suggest great caution in exposing our children to not only our own fear or anger but also to fearful events and news that even we find horrific. Happy New Year dear families in Santa Cruz County! Keep up your good parenting. The dividends are invaluable! Please share our newsletter with new friends so they won't miss a few tidbits of wisdom from our author contributors, and as always our many fun events! We are still activating posts on our calendar so be sure to check the online calendar for more events over the weekend. "Start the new year at a California state park! #FirstDayHikes are back and there are more than 50 state parks hosting more than 80 guided hikes. Take a walk on beach, explore redwood groves, hike through snow or check out a cultural site at a state park near you on January 1st! California State Parks Invites the Public to Kick-Off the New Year with a First Day Hikegoldrushcam.com"
Thanks to a partnership between California State Parks and Google Maps, you can now visit many of our beautiful parks right from your computer, tablet or smart phone. A total of 110 state park destinations have been filmed using Google Trekker, a backpack-mounted camera that provides 360 degree footage. 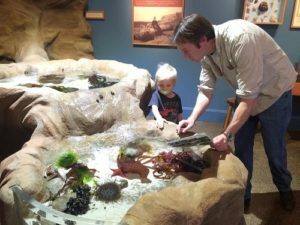 Explore what it means to be a naturalist in Santa Cruz County and get your hands wet as you examine local marine life in our brand new intertidal touch pool. Learn about the Museum's beginnings with lighthouse keeper Laura Hecox more than 100 years ago, and see what it means to be a collector. Through hands-on explorations with real specimens in our nature lab, visitors of all ages will discover the wonder of our region's natural history and recognize the naturalist within themselves. This is the first permanent gallery renovation in over 20 years and is part of a larger project to update the Museum's exhibits. I think about the needs of young children a lot. I try to inspire adults towards deeper connecting with young children. I make suggestions, I advise, I encourage and I offer guidance when asked. It is both my passion and what I think will make a brighter future for us all. This year I have seen the needs of young children take a back seat to the fear created by the angry adults we see all too often in the news. Our world is indeed in a mess but I am sure that fear and anger are not leading us to a path to renewal. At this time of year many cultures celebrate events from the past, stories of special people from long ago. There are common themes we can glean from those powerful stories dear to various traditions including the stories of the birth and life of Jesus, the stories of the Maccabees, and stories of the return from exile of Ram. These stories point us toward hope, resilience and love as the key to change, to our own soulful renewal. The annual experience of the Winter Solstice gives the same picture. The days have been growing shorter and shorter leading up to the day of the Solstice, the shortest day of the year, and the longest night. And the very next day, the light begins to return. The days gradually lengthen and the nights grow shorter. The darkest night of the year is the gateway to the return of the light, the return of the Sun. Let it shine, let it shine...What we all need is to connect with our own light. The same light that shines from the Sun and the stars lives inside each one of us. When we feel that light inside, we can live with hope and send out love into the world and to those around us. This might seem like a lofty idea. Maybe it is, but it is something we can do. We can! The children are depending on us to show them that hope lives and love is a force of protection and transformation. Not fear and anger, but surround the children with our hope and love. Young children learn about the world, and learn how to be in the world by imitation. Give them your hope and love to imitate. Hope and love are stronger than fear and anger. Always remember that! Every year we are reminded of this by the many celebrations in mid-winter. There are so many symbols of light overcoming the darkness, of resistance and resilience powered by hope and love. Let them into your heart. For the children. For yourself. For the world. It's time for change and it starts with each one of us. Each small candle casts light into the darkness. The light of many candles can illumine a darkened world. Mount Madonna School PreK-12, Art & Play in Pre & K! Looking for something you saw in a previous newsletter? Details: Spend the dayice skating in a winter wonderland right by the Bay. click to view website Happy New Year! click to view website New Year's Noon for the Children! Details: Dance, play, act, perform, create and sing our way into 2019!